By Michelle Gellis, AP, DiplAc. 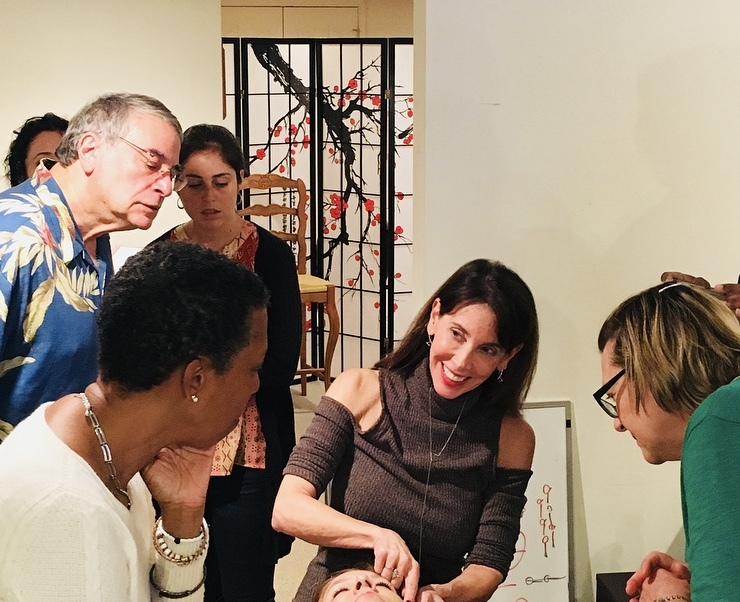 For those seeking to add Facial Acupuncture to their practice, this article discusses the importance of proper training with facial acupuncture CEU certification classes. Facial Acupuncture, also known as Cosmetic Acupuncture, is one of the fastest growing areas in our industry. When done properly it can add value and an additional stream of income to your practice. Many practitioners have recognized this and are jumping on the bandwagon. However, some are attempting to practice without getting facial acupuncture certification. This has lead to untrained practitioners, and improper technique which unfortunately is being publicized on social media, and other places on the internet. 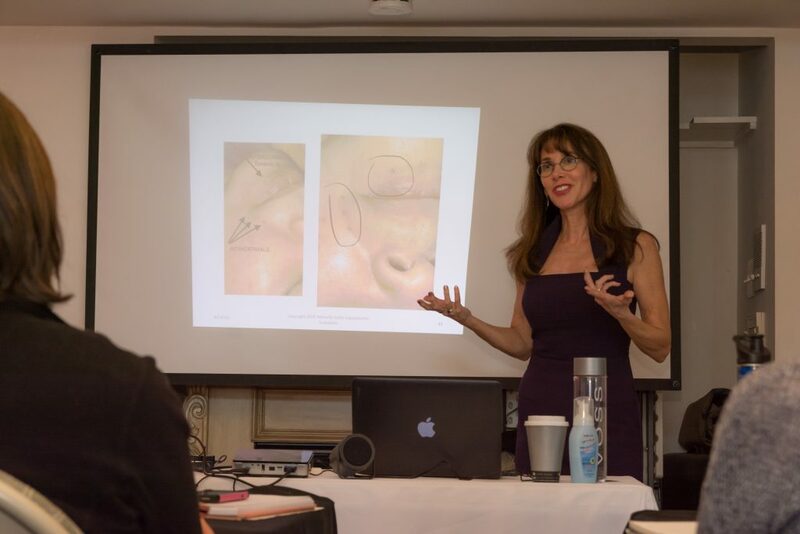 As a nationally recognized, published expert in facial acupuncture my facial acupuncture CEU certification classes are designed to uphold the integrity, safety and professionalism of cosmetic acupuncture. 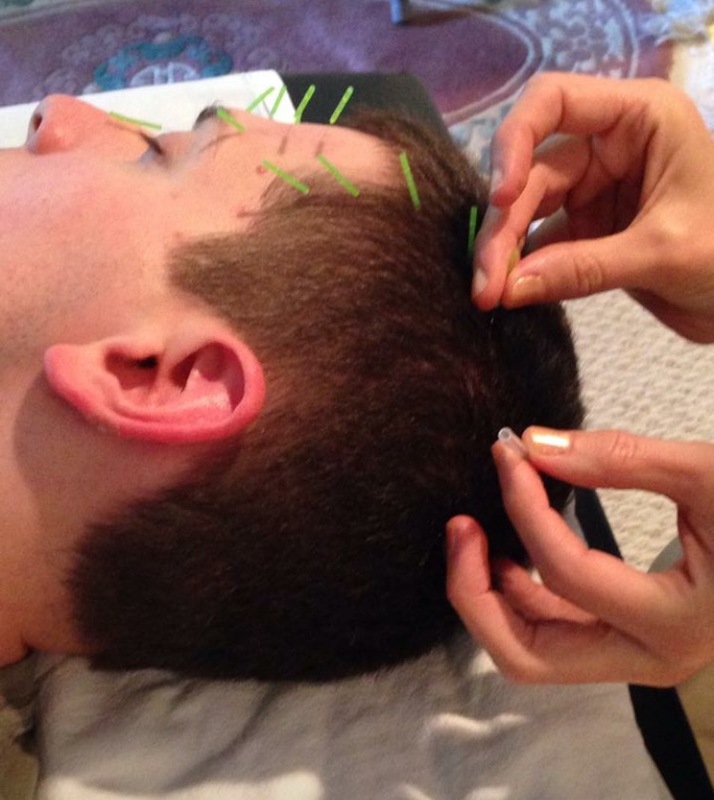 Many of the photos circulating on social media portray facial acupuncture practices involving excessive needles, placed improperly. 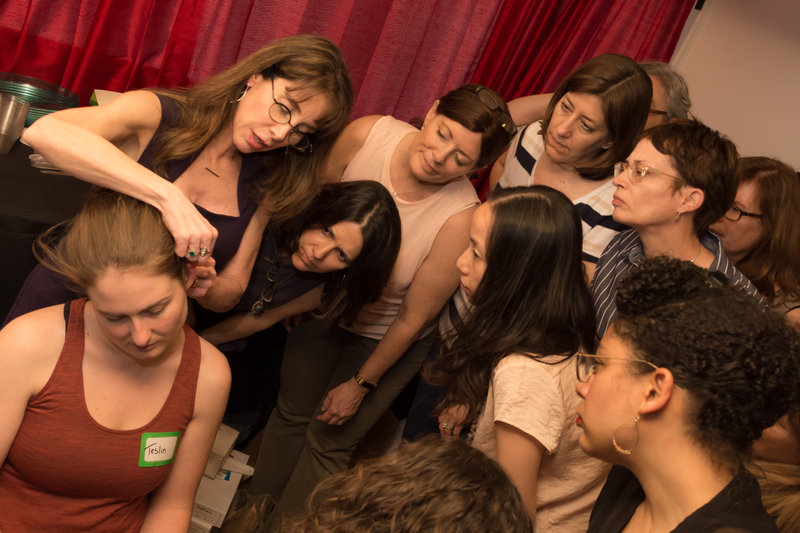 The following are five reasons why it is crucial to get facial acupuncture certification before attempting to practice on your patients. 1) The overall efficacy of facial acupuncture treatment is dependent on in-depth knowledge of Facial Anatomy and Neuroanatomy. 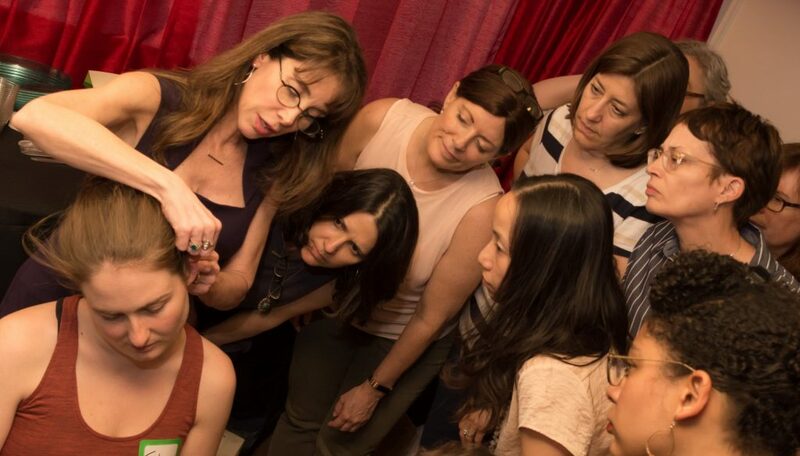 During a facial acupuncture CEU certification class you will review the nerves, muscles and bones which make up the intricate facial structure and function of the facial nerves, muscles and vascular system. 2) TECHNIQUE, TECHNIQUE, TECHNIQUE! Proper needling technique must be taught in a hands-on supervised environment. 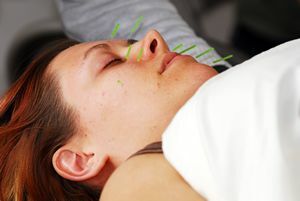 Facial acupuncture has unique safety concerns. Due to the number of needles used in facial acupuncture, the fragility of the facial blood vessels and capillaries, proper training is required to understand the precautions which must be taken in order to avoid bruising or swelling. Additionally, techniques such as submuscular needling, proper use of intradermals, facial motor points, and scalp acupuncture are not something you can self teach. The photos below represent proper and improper needling techniques. 3) Learning to screen for contraindications is imperative. Unlike most forms of acupuncture, facial acupuncture can have serious side effects if done improperly. Migraines, stroke, bruising and feinting can occur if these contraindications are not screened for thoroughly. Facial Acupuncture CEU Certification Classes will review potential contraindications to treatment. 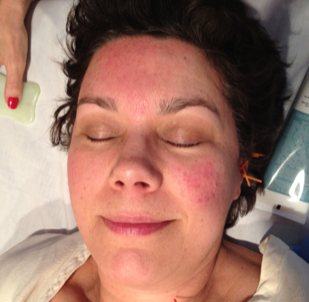 4) Facial Acupuncture must include a comprehensive treatment protocol. In order to properly ground the patient, address underlying pathology, and treat all levels of the face (skin, muscles, fat, etc.) body points, clearing treatments, facial cupping, facial gua sha and microneedle derma rolling should all be included in treatment. 5) It’s not just about wrinkles! Skin care is not something that is typically taught in acupuncture school. Treating conditions such as acne, melasma, rosacea, large pores, brown spots, “drinkers nose” broken capillaries, pale skin etc. 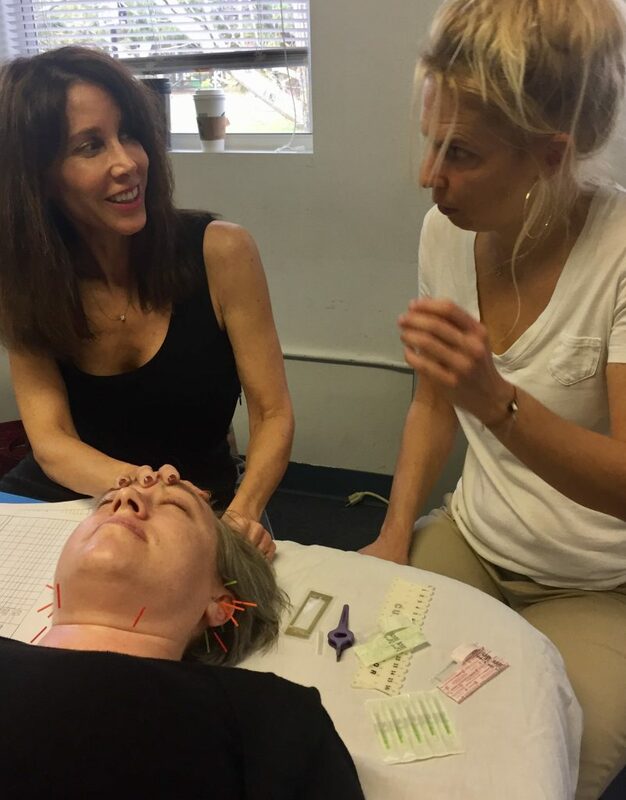 requires knowledge of the etiology, TCM protocols, nutrition, and topical products which can rejuvenate and maintain a youthful and healthy glow to the skin.You can learn more about Gellis Facial Acupuncture CEU Certification Classes by visiting my website. All classes are NCCAOM, FL and CA approved for CEUs. 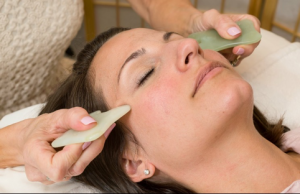 Facial Gua Sha is a technique in which specially crafted hand held pieces of smooth jade are used to invigorate the skin, smooth out wrinkles and increase blood supply. Facial Gua Sha can be used to treat a variety of skin conditions such as Acne, Rosacea, Melasma and dark circles. Facial Gua Sha is used as part of a compreh. ensive acupuncture facial rejuvenation program for wrinkles, sagging and puffiness. Facial Gua Sha benefits areas such as the neck and jowls, which are prone to sagginess, the puffiness under the eyes, and the deep wrinkles on the forehead. The increased blood circulation which occurs during Gua Sha, helps to detoxify the face and move stagnant blood and inflammation, which can occur under the eyes. By providing increased blood flow to the face, the skin is better nourished and healthier. Part of the benefit of the treatment is that acupuncture points on the face are massaged with the Gua Sha tool, which in turn benefits the Fu organs. Conditions such as TMJ, Bell’s Palsy, Rosacea, melasma and other inflammatory conditions can be effectively treated with facial Gua Sha. 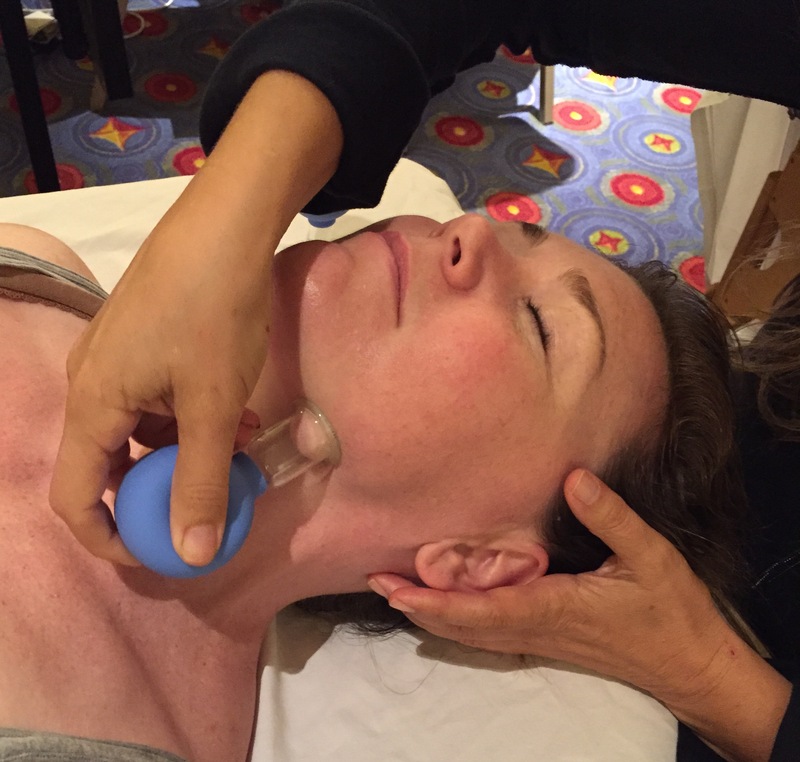 Facial Gua Sha is typically done as the last step of a facial acupuncture treatment. When done properly, there should be no residual redness on the patients face. When I teach Facial Acupuncture Classes, I tell my students that the goal is to get the “gua” without the “sha”. As we age our skin goes through many changes. Some of these changes have to do with fluctuations in our hormones, which can cause acne or dark spots or patches (melasma). For many women in their forties and fifties, adult acne can appear along with winkles, causing a double whammy! Even if you did not have acne as a teen, the surge of estrogen which occurs right before menopause or the hormonal changes that occur in your child bearing years can cause acne or dark or red areas on the face and neck. Facial acupuncture is an excellent treatment for acne, age spots, and melasma. Facial Acupuncture is uniquely suited to addressing these concerns due to the fact that it treats the underlying causes of skin issues. An acupuncturist diagnoses your body’s imbalances based on a much different paradigm than western medicine. Chinese medicine dates back more than 5000 years and is the oldest form of medicine currently practiced in the world. Complete with its own theory, diagnosis, and treatment, it is a stand-alone healing system. After feeling your pulses and looking at your tongue, an acupuncturist will evaluate whether your skin condition is due to what is referred to in Chinese medicine as stagnation—deficiency or excess in the liver, kidney, heart, spleen or lung Qi (pronounced chee). Acupuncture points are then used to balance the hormones, and treat any excesses or deficiencies. In addition to correcting any imbalances in your hormones or organ systems, acupuncture induces a deep state of relaxation. Stress can cause chemicals called neuropeptides to flood your skin and wreak havoc. They increase inflammation, widen blood vessels, increase skin permeability and generate excessive moisture. Stress hormones such as cortisol can cause outbreaks of acne, just as the overproduction of melanocyte-stimulating hormone (MSH), caused by stress can ccreate melasma outbreaks. 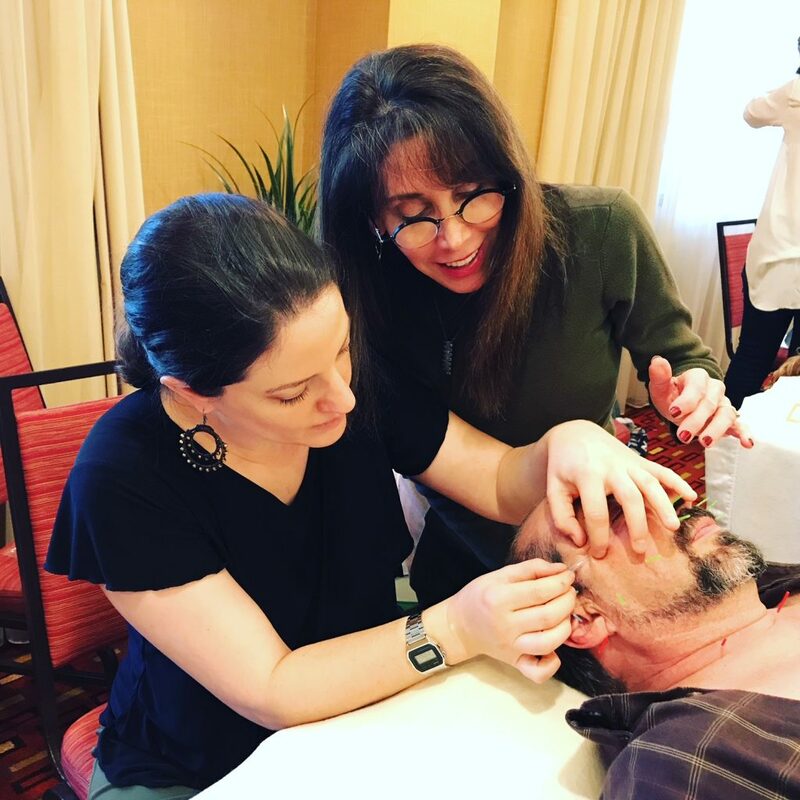 As a Five Element acupuncturist who teaches facial acupuncture classes nationally, I was surprised to learn that one of the basic principles I was taught in school is unfamiliar to most acupuncturists. Rooted in Five Element Theory, the practice of clearing blocks before initiating treatment is at the core of my facial acupuncture classes. A block is defined as a break in, or impediment to, the smooth flow of Qi. Blocks can prevent treatments from being effective or holding. They must be cleared in order for healing to take place. There are several types of blocks. They can show up on the pulses as a disparity in the strength of one pulse in relation to another or in the strength of the left side pulses to the right. Other ways blocks can show up are in a patient’s affect, physical or emotional well-being, or appearance. Blocks to treatment can take many forms. They can be energetic such as: Aggressive Energy, Pulse Qualities, and Entry/Exit. They can be Lifestyle blocks such as: Diet, relationships, and substance abuse. Some blocks are structural like a scar. Others blocks to treatment relate to a patients’ dependence on the illness for sympathy, or financial reasons. Blocks vary in severity and significance. Some are dire and require immediate attention such as when the pulses on the right side are greater in quantity and quality then the left (referred to as an H/W), some are less severe and will show up from time to time, like a pulse quality or a spirit block. One block that I address in every patient is Aggressive Energy (AE). It is created by toxic or polluted energy that moves along the K’O cycle. According to Five Element theory, Aggressive Energy is: “Qi which is contaminated and polluted and whose quality is poisonous and destructive.” AE will cause problems within the total energy of the body, mind and spirit (Worsley, 1990). AE must be cleared to prevent its spread to other officials during treatment, hence its clinical significance in Facial Acupuncture. AE can occur after surgery, emotional or physical illness or a variety of other conditions. It is drained through the Yin organs via the Back Shu points. The test for AE is also the treatment; there is no other way to diagnose with certainty that a patient has AE. The image below shows a patient with AE. Needles are places in the Back shu points (BL13, 14, 15, 18 20, 23) and test needles are placed in each of the three Jiao, if the redness around the needles is different than the test needle, then AE is present and must be drained. If other more severe blocks (such as ID’s) are present, AE will not clear until the other blocks have been cleared. We all know how those sagging jowls, fine lines, eye bags and lackluster skin can affect our psyche. But according to ancient Chinese wisdom the opposite is also true. The emotions that we express each day will over time become permanently imprinted on our face. For example, the habitual expression of worry and anger bring the brows together causing the “11’s” (deep furrows between brows.) Depression and stress are known to cause hormonal and nervous-system activity that can trigger changes in the skin. Unbalanced hormones can lead to premature thinning of the skin as well as dark patches (melasma) and acne. If your adrenals glands are over stimulated (too much stress) it can lead to dark circles under the eyes. Traditional Chinese Medicine (TCM) thinks of our internal organs as integrated systems that disperse the Qi (energy) they generate. In that way, seemingly distant organs can have an impact on facial beauty. According to Chinese Five Element Theory, our emotions correspond to different organs systems. Therefore, someone who worries a great deal can injure their stomach organ. This disharmony in the stomach organ (earth element), may result in dampness by blocking Qi flow and nutrients, resulting in puffy eyes. The knowledge of Five Element and TCM theory enables an acupuncturist to feel your pulses, study your tongue and know which of the body’s systems have been injured or are struggling and to make adjustments which can have tremendous impact on both your skin and your overall health. Acupuncture Facial Rejuvenation not only addresses the outward appearance of the effects of aging, it also can ease stress, depression, worry and frustration which can cause premature aging. Regular acupuncture treatment helps to balance hormones, calm overactive adrenal glands, and create a sense of calm. Points along the channels (called meridians) which correspond to different organ systems can help to provide a sense of relaxation and well-being which translates to a more relaxed, vibrant appearance. The calming nature of acupuncture also decreases heart rate, lowers blood pressure and relaxes the muscles. In addition, acupuncture improves circulation of blood throughout the body, which brings oxygen to the tissues and clears out cortisol and other waste chemicals. 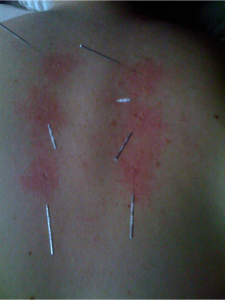 The needles themselves elicit a healing response to the microtrauma caused by the needling. Collagen is produced and disbursed, helping smooth out the wrinkles. All of this together can take years off your face, without side effects, toxins, fillers or surgery. Call Michelle Gellis to see if Acupuncture Facial Rejuvenation might be just what you need for your “moody skin”. I frequently receive calls from acupuncturists asking what the benefits are of taking classes in acupuncture facial rejuvenation. Acupuncture and Oriental medicine can be very effective at treating skin conditions. Treatments can provide quick relief for acute symptoms, as well as significant and lasting relief from recurrent or chronic skin conditions. The skin reflects and reacts to imbalances within the body’s internal landscape and the effects of the environment. Internal disharmonies caused by strong emotions, diet, and your constitution can contribute to the development of a skin disorder. Environmental influences, such as wind, dryness, dampness and heat can also trigger or exacerbate skin disorders. To keep your skin healthy and beautiful on the outside, you must work on the inside of your body as well. Increasing the flow of energy, blood and lymph circulation improves the skin’s natural healthy color. Promotion of collagen production increases muscle tone and elasticity; this helps to firm the skin. Stimulating the formation of body fluids nourishes the skin, adding moisture and making it softer, smoother and more lustrous. General skin conditions that can be treated with acupuncture and Oriental medicine include acne, dermatitis, eczema, pruritus, psoriasis, rosacea, shingles and urticaria (hives). Evidence that acupuncture and herbal medicine have been used for skin disorders, such as hives, can be found in early medical literature dating back to 3 AD. Medicinal plants and stone needles were utilized to relieve and cure discomforts of the external areas of the body. Oriental medicine does not recognize skin problems as one particular syndrome. Instead, it aims to treat the specific symptoms that are unique to each individual using a variety of techniques including acupuncture, herbal medicine, bodywork, lifestyle/dietary recommendations and energetic exercises to restore imbalances found in the body. Therefore, if 10 patients are treated with Oriental medicine for eczema, each patient will receive a unique, customized treatment with different lifestyle and dietary recommendations. Acupuncture views nutrition in a complex light, through the application of Oriental medicinal wisdom to dietary habits. In short, certain foods are considered too “yang”, or hot, to eat in excess during the warmer months, while others are prized for their “yin” ability to cool the body. Overall, the goal is balance between the internal yin and yang of the body. A healthy, nutritional diet, good sleep and moderate exercise can keep your skin and physical form at its best. Chronic Dry Skin? Try Acupuncture! According to the theory of acupuncture and Oriental Medicine, the lung organ has important associations with any condition relating to dryness. One of its primary functions is to lubricate all the other organs, including the skin as this is the largest organ of the body. The skin plays an important role in detoxification. The lung is also known as “the delicate organ” due to its sensitivity to hot or cold temperatures. To further demonstrate the relationship between the lung and dryness, the Neijing, a highly regarded acupuncture and Oriental medicine text, states that “the lung has a natural aversion to dryness.” Not only is the lung vulnerable to dry conditions, but when affected, it can cause conditions of dryness in other areas of the body. Therefore, a practitioner may diagnose a patient exhibiting symptoms of chronic dry skin as having a lung imbalance. If you have concerns regarding your symptoms of chronic dry skin, contact us for a full evaluation to discover what imbalances within your body may be contributing to your symptoms! Hives (urticaria) are swollen and red bumps, patches or welts on the skin that appear suddenly. Itching is the most common symptom associated with hives, although some people report that hives cause a stinging or burning sensation. Hives can occur anywhere on the body including the hands, face, lips, tongue, throat or ears. A sign that the whole body is experiencing a hypersensitivity reaction, a hives outbreak can occur due to a wide array of stimuli. While intolerance to certain foods, additives, intense emotions, sunlight exposure and medications can all cause hives; in 70-75 percent of outbreaks, the exact cause of hives remains unknown. Whether they last for just a few minutes, a few hours or persist for several weeks, hives are rarely a medical emergency. However in some cases, they are the first sign of a strong allergic reaction to something and can be accompanied by shock or difficulty breathing, which can be life threatening. About 20 percent of people will experience hives (urticaria) at some point in their lives. While standard treatment for acute cases of hives involves antihistamines or a corticosteroid drug to relieve symptoms, many people are turning to acupuncture and Oriental medicine to address underlying imbalances that cause this condition and help stop recurrent outbreaks. In Oriental medicine, an outbreak of hives is described as wind invading the skin and the meridians, causing itching and swelling. When the eruptions are red, it is an indication that wind and heat are involved. When the eruptions are a pale pink or white, it is likely that the diagnosis will be wind-cold invading the skin. How the condition is diagnosed will determine what acupuncture points are used, what herbal medicines are prescribed and what lifestyle/dietary recommendations are made. Treatments are directed at addressing both the cause and the symptoms by providing immediate relief from the itching and swelling and addressing the underlying imbalances and triggers that are causing the condition. A study published in the Internet Journal of Dermatology examined the efficacy of acupuncture in the treatment of chronic hives (urticaria). The results showed that acupuncture was able to reduce both episode rate and episode duration of urticaria by as much as 25 percent. After three weeks, the majority of the acupuncture-treated patients experienced partial remission of their symptoms. The researchers also noted that the greatest improvements were seen in the third week of treatments and that the efficacy of acupuncture seemed to increase with each treatment. Eczema, or atopic dermatitis, is a skin disorder resulting in rough, red and itchy patches on the body. In addition, there can be a host of other symptoms and complications that can greatly vary between individuals. 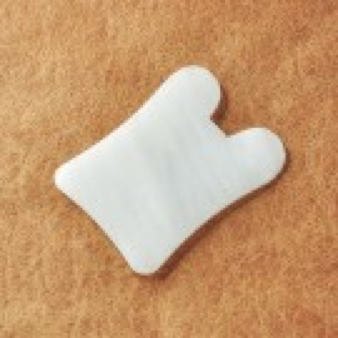 For some, small blisters may be present that when scratched, may bleed or ooze fluid and then crust over when dry. For others, a persistent need to scratch itchy skin may cause anxiety and sleep problems. Other symptoms of eczema include nighttime itching, red or brown skin discoloration, bumps that ooze fluid and harden when dry, scaly-looking, thick, cracked or dry skin, skin inflammation or sensitive, uncomfortable skin sensations. Complications that may arise from the symptoms of eczema include asthma, allergies, skin infections, insomnia, emotional problems or eye problems. Usually, eczema is considered a chronic condition as it can take a long time to resolve. There may be long periods of remission, when the skin shows no symptoms. However in the presence of a trigger, such as pollen or dust, or after a stressful life event, symptoms of atopic dermatitis may come back. Other potential triggers for eczema include dry skin, bacteria and viruses, stress, excess sweat, hot and humid environmental conditions, wool, certain chemical cleansers and soaps, smoke/air pollution and certain foods like eggs, milk, wheat gluten or peanuts. Due to the red and itchy nature of skin affected by eczema, acupuncture and Oriental medicine largely defines this condition as one related to heat. This manifestation of heat on the skin may stem from an internal imbalance (e.g. a weakened immune system), an allergic reaction (e.g. peanut allergy) or a combination of both these internal and external factors. According to the philosophy of acupuncture and Oriental medicine, there are many reasons why the body may succumb to a heat condition and lead to the manifestation of eczema symptoms. Strong or prolonged emotions such as anger, rage or jealousy may contribute to a pathological buildup of heat. Overworking may also be a contributing factor, as this may interfere with other activities such as exercise and things that bring joy and pleasure into one’s life. Each patient will have a different set of circumstances. At the time of your visit, mention any emotional or behavioral difficulties you feel may be related to your eczema. This way, a treatment plan can be developed that will address all of your symptoms.